Retrieves emails from any standard POP3 server. Mail and MIME parser - C#, VB.Net component (library) that is 100% compatible with RFC822 and MIME standards. Mime4Net supports field encoding/decoding, attachment extraction and is extremely tolerant for improperly formated messages. The Internet Anywhere Corporate Email Server is a high performance, multi-threaded email server which supports IMAP, POP3 and SMTP. It provides everything you need to run a secure and dependable email system. The NoticeWare Email Server is a high performance, multi-threaded email server for Windows NT4/2000/2003/XP which supports IMAP, POP3 and SMTP. It provides everything you need to run a secure and dependable email system. Regain control over your e-mail messages by stopping spam and email viruses! ... automatically extract addresses from the internet! No more expensive mailing lists!A simple yet invaluable tool that can automatically dig out all of the Email addresses from web pages, text files, and even scripts! You set the search words and parameters! Full database support: Sort, Edit, Add, Delete, CSV and Text Export!. Great for mailing lists and mail merge. Voice email plug-in for Outlook. Record voice messages in an Standard MP3 format that you can send to anyone. From time to time users do change their e-mail addresses due to some reasons (lost password, SPAM flows, etc). Therefore it is a good idea to validate the Email addresses in your Address Book and mailboxes periodically. Try eTopping Outlook Email Verifer for FREE. This program allows you to send internet mail directly from a Windows PC to its destination on the internet, and it will also accept email from other servers for you. . 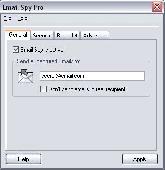 This program allows you to send internet mail directly from a Windows PC to its destination on the internet, and it will also accept email from other servers for you. Bulk email software, email newsletter software and email marketing software helps you build opt-in mailing lists, manage email newsletter marketing campaigns, create and send bulk HTML emails campaigns and track personalized email results. Helping you make subscription to email lists on Internet websites. It uses POP3 email accounts to receive subscribe and unsubscribe requests from respondents, extracts email addresses and sender names from email messages and creates plain-text files. 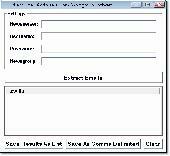 A Windows software tool that archives email and document history for fast, secure and easy retrieval. Full text indexing of emails, PDF, text, html, and MS Office documents. Free trial version allows unlimited documents.